A rare opportunity to secure this centrally located site across 1665m2 of level land ready to be cleared and developed. 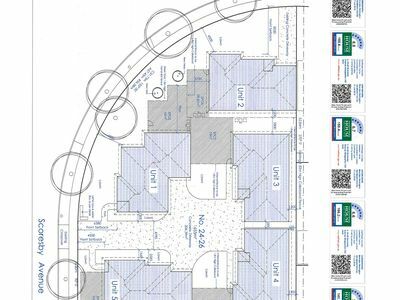 A planning permit has been issued to allow for the construction of a 5 unit complex. Plans have also been drafted and will be included in the sale of the property. The Purchaser has the option of constructing the 5 units at once or subdividing the land into 5 separate titles for individual construction financing with the banks and/or builders. •	Existing dwelling – not habitable. •	Planning permit has been fully endorsed. •	Drafted plans for the 5 unit site have been drawn up and are included with the sale of the property with full council approval including energy ratings for tendering & construction. •	Plan for subdivision has been lodged on SPEAR (subdivision application website). 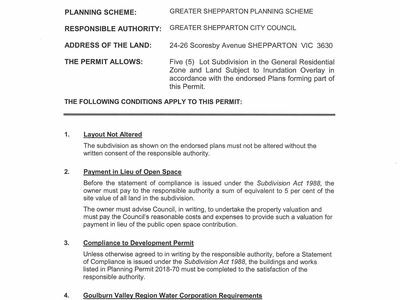 •	All authorities - Powercor, GV water, Goulburn Broken Catchment have agreed to certification. •	Drainage plan has been approved by council. •	Council will issue certification on the buyers acceptance of the section 173 agreement (this has already been drafted & ready). The council agreement will allow for separate titles without prior installation of drainage, building construction & landscaping works for an approximate cost of $800. •	Obtaining the council agreement allows the buyer/developer to go forward to the bank on separate titles with the security of a construction loan. 5 individual building construction loans can then be obtained. •	Upon purchase of this property council will be able to issue a revised agreement to include the new Purchasers details.